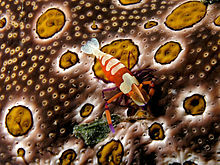 The Emperor Shrimp (Periclimenes imperator) is a species of shrimp with a wide distribution across the Indo-Pacific. It lives commensally on a number of hosts, including the sea slug Hexabranchus (Medusa Worm). A. J. Bruce first described it in 1967 based on eight specimens ranging from 4 millimetres (0.16 in) to 7.6 millimetres (0.30 in), and found Periclimenes rex to be its best resemblance. Note: This emperor shrimp is currently paired with a medusa worm. Caution: Because it is an invertebrate, acclimation is critical with this (and really all shrimp). Shrimp are intolerant to copper, high ammonia/nitrates, & low salinity.